There are times when things don’t always go as expected, but the way we manage those challenges says a lot about who we are. When it comes to member accounts with the Credit Union, no one wants the situation to advance towards collections. Even if it does, LGFCU wants you to know there is a way out. In fact, LGFCU Recovery Assistance was created to work with each member to help restore their good standing with the Credit Union. If you're watching this video, you've probably received a letter from Local Government Federal Credit Union. And that letter addresses your loan default with LGFCU. My name is Sarah. And I'm a recovery specialist to LGFCU. I'm Abdul and I'm also a recovery specialist with LGFCU. Like you, we're both members. And while we recognize that there are times members can have challenges making payments, it's still your financial obligation to pay off your loan. Because all LGFCU members, including us, are depending on you to fulfill your responsibility to the credit union. Plus, if you're on the road to financial recovery, this is a good time to discuss a payment plan with LGFCU. We'll work with you to set up a custom repayment plan or work out a settlement agreement. Not only do we want to make sure your LGFCU loan is repaid, we'd also like to reinstate you as a member in good standing. If you are able to obtain an active account and are considered to be a member in good standing, LGFCU can provide free financial counseling and resources designed to help you stay on track. And as with many relationships, the key to success is open communication. The first step is reaching out to talk to us about a payment plan. We'll help you get back on track with LGFCU. Having bad credit can greatly impact your ability to make purchases, get a job or even rent an apartment. 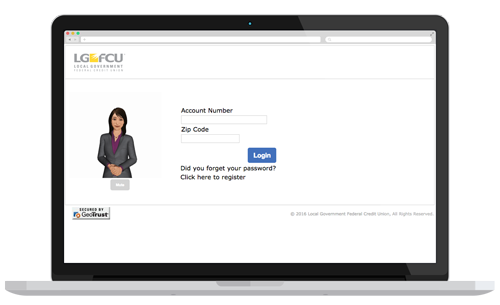 And, if your LGFCU account is “inactive” due to outstanding debt, that status will restrict access to additional LGFCU benefits and services. Our qualified LGFCU Recovery Specialists will work with you to develop a payment plan to pay off your LGFCU debt or work out a settlement agreement. Once your account becomes “active” again and you’re considered to be a member in good standing, LGFCU can provide free financial counseling and resources designed to help you stay on track. Work with LGFCU Recovery Assistance today to begin the process of paying off your debt. Read the FAQs if you still have any questions. Call 844.256.2272 to speak with Recovery Specialists Sarah S. or Abdul P.
Am I being contacted by a third-party collection agency? No. Our recovery specialists are employees of Local Government Federal Credit Union, and are based at our headquarters office. The credit union values our members and we recognized the need to provide a specialized service to those members who have charged-off loans. Will this item be removed from my credit file? No. The charged off account information will remain on your credit report for seven years. However, the account status will be updated to show “Paid Charge-Off” and the balance will be updated to zero. Paying an outstanding charged-off account will help reduce the negative impact on your credit file. How soon will my credit file be updated? We report to Equifax once the charged-off account has been paid or settled in full. This report is sent once a month and it is then up to Equifax to update the item. Therefore, we suggest that you allow 45 to 90 days for the update to show on your credit file. Do you report updates to my credit file monthly? Yes. The charged off balance will be updated based on the recovery payments that have been made. But be aware that it will still show as a charge off account. Why are you attempting to recover the debt when you have already taken me to court and obtained a judgment? Even though the courts have awarded the Credit Union with a judgment in our favor, you are still responsible for payment of the account plus the court fees. Our recovery specialist can work with you to agree on a repayment plan of the account based on your individual circumstances. The recovery specialist has additional repayment options that are not available to you at the court or local branch. Can a judgment be released? Yes. Once the account is paid or settled in full, we will notify the courts and request the judgment be released. Do you charge interest or late fees on the charged-off balance? No. LGFCU values our members and understands that life doesn’t always go as planned. LGFCU has made a conscious decision not to charge interest or late fees. All payments received on a charged-off loan are applied to the principal balance. Can I pay at the branch? Yes. You can always stop by your local branch to make a payment to your charged-off loan. Just bring a valid ID for verification purposes, however, the LGFCU Recovery Specialist who is now managing your charged-off account will work with you to discuss a payment plan. The LGFCU Recovery Specialist has additional repayment options that are not available at the branch. Can I get my share/checking account back with LGFCU? Yes, with a few exceptions. You must have paid or settled the charged off account in full, paid all outstanding fees in full, and have no outstanding balance on the account that would be considered a loss to the Credit Union. You may then visit your local branch and reopen your share account. It is our goal to welcome you back as a member in good standing by having an account in an ‘active’ status. Yes. It is possible to get another loan. Before you can apply for another loan with the branch, any charged-off loans must be paid or settled in full and any outstanding fees must be paid in full. You must also have an open and active share account with $25 in it. At this point, we could process an application to determine if you meet the necessary guidelines for loan approval. We are required to only speak to the debtor. We must verify that you are the person who is responsible for the loan. Can I have someone else make payments for me? Yes. If you would like LGFCU to speak with another person on your behalf, we will require written permission to do so. Set up a payment schedule or easily make a payment using our online system.